Word of mouth has been among the best forms of spreading brand awareness and product recommendations since… well, since any other strategies even existed—and it remains one of the most reliable, according to new research from social data and analytics firm Engagement Labs. The firm’s new report, published in MIT Sloan Management Review, reveals that 19 percent of U.S. consumer purchases are traced to consumers talking about brands online and offline. And while there may be little correlation between what consumers say online and offline about brands, both streams of conversation can have big effects on a company’s sales. The article, “Deriving Value from Conversations about Your Brand,” is based on analytics conducted and authored by three executives of Engagement Labs in conjunction with Koen Pauwels, professor of marketing at Northeastern University. The analytics determined correlations between consumer conversations and purchases for 175 brands across multiple sectors such as beauty, personal care, retail, technology and food, as well as more detailed analytics of 21 brands, including Apple, Intel, A&W, Campbell’s, Lay’s, Red Bull, and Revlon. 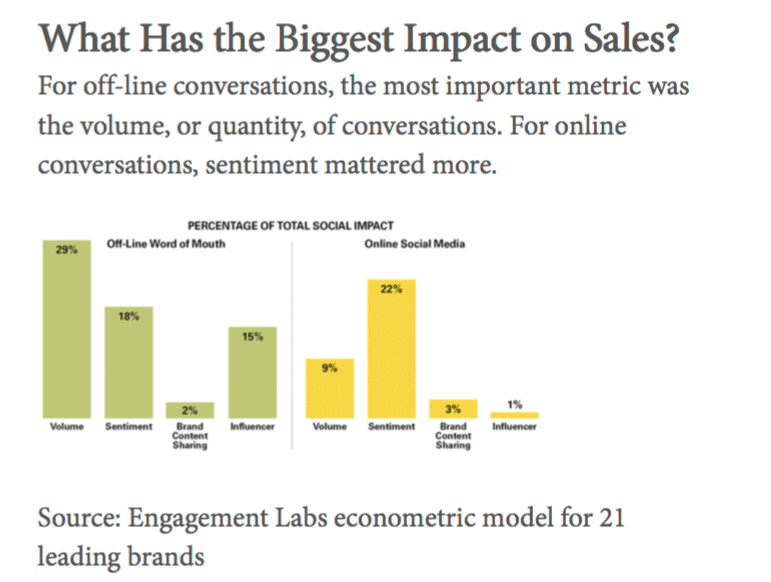 The analytics found that offline and online conversations had similarly large impacts on sales. For the 21 brands most closely studied, 9 percent of purchase decisions could be traced back to online conversations and engagement that occurred on social media (including Facebook, Twitter, Instagram, YouTube, blogs, and customer forums). A slightly larger share—10 percent of sales—was related to offline conversations as measured through continuous surveys. For offline conversations, the most important metric was the volume, or quantity, of conversations. While for online conversations, sentiment mattered more. Notably, the analytics found that online and offline sentiment often move in opposite directions. Another metric worth tracking is the extent to which the brand is being talked about off-line by “influencers”—people who regularly give consumer advice. Engagement Labs recommends that marketers look for ways to drive more positive conversations both online and offline. In many cases, this will mean going back to marketing fundamentals—rethinking product design, market segmentation, customer service, messaging, and channel selection—with social strategy in mind. Understanding the value that each type of conversation may provide—and how—can help businesses develop smarter marketing strategies and make targeted investments that lead to growth. Download the MIT Sloan Management Review article here. Engagement Labs’ TotalSocial platform measures online and offline conversations on 501 U.S. brands. For this analysis, we collected online data for 2015 and 2016 and offline data for 2013 through 2016. Our continuous survey research program yielded data on brands from an average of 7,000 offline conversations per week with consumers ages 13 to 69. A regression analysis to link the online and off-line conversations to third-party weekly sales data that we acquired for 175 brands, and to weekly ad expenditure data for a subset of 21 of those brands using a method known as market mix modeling.